"Please Don't Ask, Please Don't Tell"
Based on a synopsis of “Please Don’t Ask, Please Don’t Tell,” I went into the episode braced for the worst, expecting to hate it intensely. As the cold open progressed, I was grateful I’d done the preparation. Andre starts with the blanket statement that black people don’t like talking about the gay and lesbian members of their families, which is a gross and offensive but also popular idea. If there was a list ranking apocryphal black pathologies, its top three wouldn’t be complete without the one about the virulent strain of homophobia specific to black people and common among them. I’ll never know why some people are in love with that idea, given that it so often feels rooted in memetics rather than personal experience, much like the “black welfare queen” or the “black-on-black crime epidemic.” It’s hurtful and tired, and I can’t even. Empire peddled the same nonsense all season—also in an arc guest starring Raven-Symone—much to its detriment. (For those who require proof, speak the words “Black Rambo” to an Empire fan and watch them giggle themselves unconscious.) I was worn out with it by the end of that season, and Black-ish was about to take the brunt of my frustration. To my surprise, once “Please Don’t Ask” gets off and running, it turns into a hilarious and effective episode, one that isn’t nearly as offensive as the cold open suggested it would be. The difference between Empire and Black-ish is scope. Empire’s use of the black homophobia idea is rooted in public sentiment, how the black community at large regards gays, so it can’t make its points without generalizing the entire race. 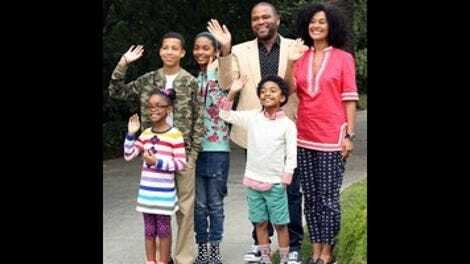 Black-ish is about one black family, and because the story is told on such a small scale, the black homophobia idea gets an interesting new context. Ruby is a black homophobic mama caricature, strident, sanctified, and stuck helplessly in a different era, and she genuinely bears no resemblance to any black woman, of any age, that I personally know. I don’t mean to suggest black women like Ruby don’t exist in real life, because they absolutely do. However, I have to consider the plausible possibility that Ruby’s material was written the way it was written because of who would be performing it. 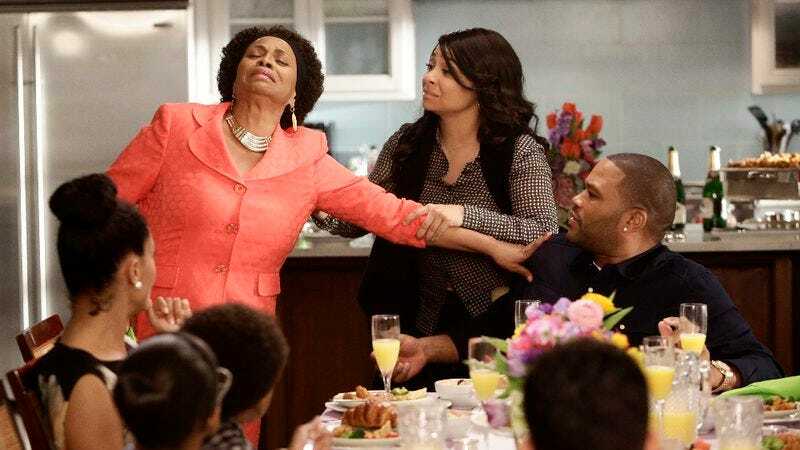 Jenifer Lewis does this. This is what Jenifer Lewis does. If Lewis is on your show as the mother, she plays the character this way, because she’s magnificent at it. Once she’s cast in the role of Andre’s mama, the gay sibling plot only tells itself one way, and this is the way it happens. The Lewis factor is important in that it acquits the show’s perpetuation of the campfire legend of black homophobia. Who cares whether or not you like or agree with the idea that black people are more homophobic than other races, if the destination is Lewis hollering “Black Jesus” after finding out her daughter’s a lesbian, the path goes straight through that idea. And naturally Lewis tears the scene apart, so it’s hard to be upset, even if it’s predictable and the kind of thing Lewis can do in her sleep. Plus, Andre’s framing of the story makes sense from a character perspective, given his constant, nagging anxiety over how his black family compares to other black families. Misery loves company, and so it would be far easier for Andre to accept that homophobia is more common among black people than to accept that his mother has some terrible attitudes just because she does. But truthfully, as delightful as Lewis’ performance is, it isn’t really essential to the episode. Andre’s shallow relationship with Rhonda is enough to hang the story on. The best scene is Andre and Rhonda’s “conversation,” which is actually just well-choreographed sandwich making and the trading of black idioms. Had the story been told without Ruby, the episode would be without its weakest moment. Andre loses a bit of my respect with every other episode it seems, and this week, he’s outing his sister and her girlfriend Sharon to Ruby. That’s an incredibly dunderheaded move, though a somewhat understandable one. What’s truly baffling is Dre announcing someone else’s wedding for them, which is insane, television behavior. I’d love a flashback episode in which we get to see how Andre became a top executive at a marketing firm despite a remarkable lack of emotional intelligence. The episode takes a bit too long to give Rhonda the opportunity to speak to Ruby for herself, and even when that moment comes, it’s seen mostly from Andre’s perspective. I have a habit of “bad news first” when writing reviews of shows, especially those I’m most passionate about, so I fear I’ve made it sound like I didn’t like “Please Don’t Ask,” when I quite liked it. It’s just really funny from beginning to end, and it contains the best Jack and Diane plot to date. Diane’s long con was brilliant, as was Jack’s final victory, and both kids got some great zingers. (Diane: “If Mom wanted raw pasta on cardboard, she’d go to Macaroni Grill.”) In fact, the entire young cast was in the zone this week. The adults were good too, including Deon Cole, who continues to hang the moon on a weekly basis. The episode has plenty of flaws, but that it manages to succeed in spite of them is almost more impressive than if they weren’t there at all. I know Laurence Fishburne is a busy man, but if there was a week for Pops to be around, this was it. Another quibble: Having Sharon show up for a family function in her mechanic get-up was way too literal. Bow’s “Erykah Ba-DON’T” joke killed me every time, and the cutaway gag with Nurse Larry was pure brilliance. I haven’t seen a flash-forward masked as a flashback since Lost. I continue to marvel at Marcus Scribner, who really is a casting triumph. Junior is the only character in this show I cannot imagine being played by another actor. Fun fact: When I was in undergrad, me and a couple of buddies had a running joke about writing a screenplay about a young black gay guy whose mother kept meddling in his love life. It was to be called Booty-Blockin’ Mama, and our dream actress for the female lead was… Jenifer Lewis.